If you are not logged in to Google, you will be asked to log in. ​If you already have a Google account, simply log in. If not, you will “Create an account”. Google makes it easy, and even offers you a free gmail account. My daughter loves Mr. H! She has learned so much in her first few months and always looks forward to her lesson. My son has been taking lessons for over a year and is progressing extremely well. I love the convenience of lessons at home. It's great to have an enthusiastic teacher like "professor H". Professor H is phenomenal! He goes above and beyond to not only help our daughter learn the drums, but to make the experience lots of fun! We are amazed at how much he's taught our daughter in just a few months, and you can tell he really cares about all his students and their success. We highly recommend him! Professor H is a great teacher and wonderful with kids. He is energetic, supportive, and excellent at what he does. My eight year old son, who just started drums with him almost one year ago, has progressed rapidly, despite his relatively young age. Highly recommended..
Mr H. (Allen Haiges) has been teaching my son since he was in 2nd grade. He is now in the 7th grade and plays in the school band. Drums were not his instrument of choice but he loves it now because Mr. H. has a great was of bringing music to life and making the lessons fun. Musically, my boys have grown tremendously and they even play solo percussion parts in the school orchestra. My 2nd son also started playing in 2nd grade and now plays in the 5th grade band. Pretty soon, my younger son will be playing too. I Love that Mr. H. teaches in the comfort of my home because it saves us from one more road trip in our busy lives. The boys love to hear about Mr. H's frequent trips to Disney to record music for Disney movies. The prizes for Student of the Month is a great incentive for them to keep on playing and improving. Mr. H. Is by far the best music teacher I've seen. He has a great personality and has a contagious love for music like his motto says, "Feel the beat!" - he truly does. Mr. H is by far the best drum teacher on the Main Line! My 11-year old son has been taking lessons with Mr. H for 2 years and has progressed into a true musician under Mr. H's tutelage. Mr. H goes above and beyond the call of duty. Last night, he took my son to a Middle School/High School Jazz concert, and personally introduced my son to his future music director. This was done by Mr. H on his own initiative and personal time! What a great teacher and a great guy! Mr. H is an all-around fabulous drum teacher! Professor H. is the greatest, we love him!!! He is everything you would want in a music teacher: talented, friendly, dynamic, enthusiastic and great with kids. My son is 10 years old and really looks forward to his time with Prof. H. We feel very lucky to have found him! Professor H is a wonderful teacher! He is great with children and my son looks forward to seeing him every week. 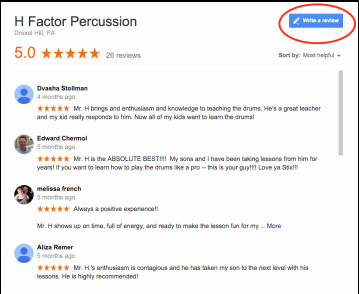 If you are looking for a drum teacher, H Factor is the way to go! Always positive, always professional. We have worked with a lot of music teachers for everything from classical to jazz and rock. Professor H knows his stuff and is always supportive and kind, and my kid is making great progress. Professor H is the best! Our two daughters have been taking lessons from him every week for the past 6 months. They love it. His positive energy and enthusiasm is contagious. They look forward to his visit every week and they have learned so much from him. Thanks Prof H!!! Mr H has not just taught my boys the drum he has inspired them. I am amazed how fast the developed their skills and how frequently they want to practice. Great inspirational teacher, very musical, loads of fun! Mr. H. is the greatest. Very helpful, knowledgeable, and enthusiastic. Feel the beat! Cannot feel the beat with a better teacher anywhere and at any age! Mr. H is the BEST! His enthusiasm for percussion is contagious. Mr. H is an amazing drum teacher. I have come so far since being his student. He is by far, the best out there. Mr. H always brings enthusiasm and a great time to all my drum lessons. He's the best! Mr. H brings and enthusiasm and knowledge to teaching the drums. He's a great teacher and my kid really responds to him. Now all of my kids want to learn the drums! Always a positive experience!! Mr. H shows up on time, full of energy, and ready to make the lesson fun for my daughter. The lessons have helped her learn to play the drums and read music, keeping my daughters interest in music growing. My daughter looks forward to this lesson each week!! Couldn't ask for a better learning experience. Mr. H is the ABSOLUTE BEST!!!! My sons and I have been taking lessons from him for years! If you want to learn how to play the drums like a pro -- this is your guy!!!! Love ya Stix!!! Mr. H.'s enthusiasm is contagious and he has taken my son to the next level with his lessons. He is highly recommended! Mr. H taught drums to my brother over 25 years ago and now teaches drums to my kids. His experience comes along with a lot of energy and enthusiasm for drumming. Mr. H has boundless energy and always wants to have fun with the music. He has answers to any questions I have about exercises, styles, and technique. He is also tuned in to the music programs in the schools, which is helpful when I am tackling music for many ensembles at once. I had Mr H for several years and he was always in an upbeat mood and was always extremely nice. He looks after his students and tries to be a friend as well as a teacher. Mr H also brought his energetic personality and made each lesson better than the last. I still communicate with Mr H and would recommend him for anyone who wishes to learn drums and also gain a friend. Simply the best. My 11 year old son has been taking lessons with Mr. H for over a year now. Not only is Allan an extremely talented musician he is also an excellent teacher. My son looks forward to his lessons because Mr. H is FUN! Allan has the ability to connect with his students, promote a (very) positive learning environment and make it fun. His high energy and infectious enthusiasm are a perfect fit for us. We highly recommend Allan. I had Mr. H from 4th grade through 12th grade, and consider him part of my family. He is a fantastic instructor and friend, and continues to encourage kids of all ages to not only practice drums, but love music and performance as a whole. He goes out of his way to help his students in anyway he can, and helped me explore music and have FUN! Thanks H!. When I was first looking for a drum teacher for my 15 year old, I didn't know what to expect or what to look for in an instructor. My hope was for someone who could relate to my son's passion for percussion and someone with the ability to take him to levels that he never could image for himself. Mr. H is all that and more to him. From his very first lesson, there was a connection and an excitement which has continued for the next 2 years. I could hear them playing and talking and Mr. H encouraging him with shouts of praise for his efforts. Not only is he so talented and experienced, but he is so knowledgeable in how to teach, communicate and create excitement in learning. I love the lesson in my home. When there are conflicts with school and vacations, Mr. H is very flexible. When I have concerns, Mr. H is very attentive and will discuss solutions to move forward. My son was auditioning for a Drum and Bugle Corp, and Mr. H was interested and willing to review the music and technique, even though it wasn't what he intended for his lesson. All lessons are action packed with 100% playing time. Mr. H is part of our family and without a doubt, someone who has made a difference in my son's life. Mr. H is the man! he is super talented in his own right and is a fabulous drum teacher for our 7 year old son. he comes to our house every week brimming with a positive attitude and the kind of energy that keeps our child excited for each lesson. he is funny, kind and generous and it is obvious that he really cares about all of his students..
My 10 year old son has been taking lessons with Allan, aka "Mr. H", for the last year and a half, and we are very pleased with not just his progress but also with how much he enjoys his lessons. Mr. H is a wonderful instructor and we especially appreciate his enthusiasm and encouragement- something that truly sets him apart from all others. Mr. H is awesome! He is a wonderful teacher - he has a great repoire with my son, Scott and has helped him to progress in his drum skills. Mr. H will focus on any areas requested, concert percussion, rock, or jazz. He cares about his students and works with them according to their interests. We have had the pleasure to hear Mr. H perform too - he is a talented drummer!.. My son is a 7th grader and has been working with Professor H for over 3 yrs. Allan has definitely taken him to the next level so much so that he is now getting snare drum solos in his school band concerts! We previously had been taking drum lessons at a music school, but the lessons were very "cookie cutter" and not keeping my son interested in music. When I asked the music teachers in our school district whom they'd recommend, 3 different teachers all said Allan Haiges is "the man". Allan has a very charismatic personality and his enthusiasm for drumming makes my son want to practice and improve his skills on a daily basis. He has become part of our family and we can't thank him enough for all of his help. I would HIGHLY recommend Prof. H as a percussion expert and all-round incredibly gifted teacher!! I'm the parent of one of Mr H's 12 year old students. It's a riot. It's wonderful. I have as much fun listening to my son's lesson as he does! Mr. H is a great guy and an awesome teacher. He's always patient, helpful and encouraging. I can't imagine getting lessons from anyone else. I started taking drum lessons rather late in life - age 54. Not only did I gain a drum teacher that knows what would be best for my improvement, taking his time to explain each nuance, and teaching me rock, jazz, and big band - I also gained a valued and trusted friend. My experience has allowed me to play at open mics and with friends and neighbors. I believe that there is no one better! My son said that he didn't like music after a bad music experience at school being forced to play a recorder. I bid on some drum lessons at a charity auction with Mr. H and that has totally changed! My son loves drum lessons. He has been taking for about 9 months now. Along with his great teaching ability, Mr. H has the perfect personality to engage kids and make learning drums fun and interesting. I never had trouble getting him to practice and he looks forward to the lessons - to me that speaks volumes! I would totally recommend H Factory Percussion. Mr. H is the best drum teacher I could ever have. He does a great job teaching and he's very happy to be around every lesson. I've been doing drum lessons with him for over 8 years and I've learned so much about music reading and rhythm. As an older student, I especially appreciate the way Allan helps break down what I've been playing by ear for many years into the necessary skills for reading the notation and paying attention to dynamics. He is also helpful with lots of suggestions about technique. And he's also a very patient guy -- when you don't get something, you feel encouraged to persist, and he won't let you skip ahead until you've broken through where you're stuck. Percussion lessons for my son with H Factor are wonderful! Mr. H is engaging and certainly talented. He introduces the students to a variety of music and offers outside musical activities for them as well. His love of music, and percussion, shine through. He is always positive and encouraging to the kids. He is always prompt and in fact extremely flexible with changes in the schedule. Recommend him very highly! Mr. H is simply a fantastic teacher. My son began lessons several years ago - by age 12 he was rocking in a rock band with his friends and playing in a jazz band at school. Most importantly, he looks forward to practicing and taking lessons, something that any parent of a teenager can appreciate. Somehow, Mr. H makes mastering the drums - which is not so easy - a lot of fun. I would highly recommend Mr. H as a percussion instructor - whether you are a kid or adult, you will be glad you did. Mr. H is the best drum teacher a kid could hope for. It seems like in every school on the Main Line, all the best drummers are H Factor students.